"Jobs, affordability, protecting the services that families count on - these are Albertans' priorities. These are your government's priorities." I am pleased to present Budget 2017. Budget 2017 is about making life better for everyday Albertans. Jobs, affordability, protecting the services that families count on – these are Albertans’ priorities. These are your government’s priorities. Let me begin by thanking Albertans for their input. I travelled from one end of this province to the other listening to their thoughts on this budget. Families want us to help create and protect jobs. Families want our government to keep investing in long-overdue repairs and modernizations of our schools and hospitals, and they want us to keep improving our roads and highways. They want us to make things more affordable and bring the deficit down, thoughtfully and prudently. Budget 2017 is aimed squarely at addressing those priorities. 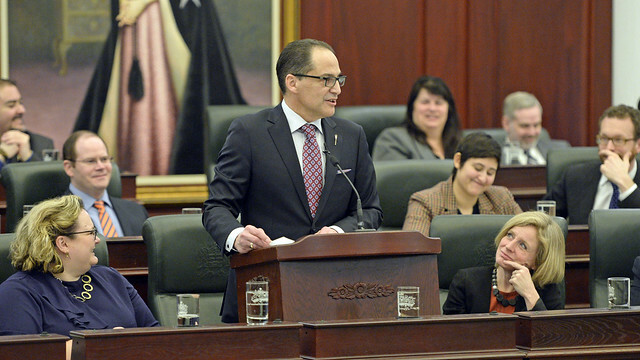 As a result, Alberta will recover from this downturn with a stronger, more resilient economy. Alberta will recover with good schools and hospitals. Because this time, Alberta families have a government that is in their corner. On this side of the House, we are going to stay in their corner. When the oil price shock hit our economy, Albertans were faced with a choice. Some said – and still say – that government should make deep cuts to public services, such as health care and education. Some wanted to implement a health-care tax that would have hurt families who could least afford it. Families would have been forced to pay more and get less, with longer health-care wait lists, overcrowded emergency rooms, much bigger class sizes, and lost jobs. That’s why our government made a different choice. We stayed focused, and we are executing a plan to diversify our economy and help families through the downturn. We are not out of the woods yet. Far from it. This year, we expect our economy to grow by 2.6 per cent, the highest in Canada. That estimate is more conservative than some, such as the Conference Board of Canada’s, that predict economic growth of 2.8 per cent. Either way, it’s clear: Alberta’s economy is set to grow. Our energy industry is on more solid footing. Drilling is increasing, with twice the number of rigs active compared with this time last year. And jobs are starting to come back – 19,000 since last July. Of course, the global economy remains volatile. Energy prices have stayed lower for longer. At the same time, our population continues to grow. These factors have combined to put additional pressures on our social services. Budget 2017 reflects that reality. Our commitment to have the backs of Albertans through these tough times remains unwavering. As is our commitment to continuing to bring down the deficit, thoughtfully and prudently. This year, we are forecasting our deficit to decline to $10.3 billion, half a billion dollars less than last year’s budget deficit. Growth in government spending remains well below many of the increases of past governments. We are keeping spending growth lower than the combined rate of inflation and population growth. And our debt-to-GDP ratio is the lowest among the provinces. Bringing the deficit down requires us to consistently bring down the growth in government spending. We froze management salaries for agencies, boards and commissions, and launched a review of salary rates. A few weeks ago, our government cut the salaries of some of the highest paid CEOs at government agencies, and got rid of golf club memberships and other perks that were accepted practice in the past. That one step will save nearly $16 million a year. We are also bringing down the rate of health spending growth while protecting patient care. We engaged Alberta’s doctors in constructive discussions and signed a new agreement that saves up to $500 million over two years. We amalgamated or cut 26 agencies, boards and commissions. We froze salaries for politicians, political staff and management in the civil service. We reduced salaries and supplies last year to the tune of $121 million. We streamlined programs such as Alberta Innovates and community partnership grants, and suspended other non-essential programs. As a result, we’ve found more than half a billion dollars of in-year savings and decreases in ministry expenses over the last two years, and we will continue to find more savings this year. As important as it is to cut waste and reduce the growth of government spending, it is critical that through this downturn we remain focused on supporting families. That starts with creating and supporting good jobs. In last year’s budget, we launched the Alberta Jobs Plan, aimed at diversifying our economy and creating good jobs. The Jobs Plan is doing its work. The economy is stabilizing and jobs are beginning to return. Now is not the time to let our steady hand waver. As our economy recovers, we will continue to bring the deficit down to balance, and we will do so without sacrificing the supports and services families need. We will remain focused on these fundamental priorities and help all Albertans weather this storm. That’s our focus. That’s our plan. This year, we will continue to build on the Jobs Plan to make life better for everyday families. Our kids deserve schools that are modern, safe and equipped to prepare them for a great future. Right now, we are dealing with issues of overcrowding and buildings that have been allowed to fall into disrepair. In some schools, there’s water damage and obsolete heating systems. In others, roofs sag and the cold winter’s wind seeps through aging window frames. That’s not right, and the decision to fix those issues for our kids shouldn’t be dependent on oil price decisions made half a world away. Our kids deserve better. Much better. Budget 2017 includes funding for 24 new and modernized schools. From Airdrie to Bonnyville, Banff to Drayton Valley, Lethbridge to Grande Prairie, and in many, many more communities across Alberta, our government is building and modernizing schools, improving the things that make a real difference in the lives of Alberta families. Calgary will see five new schools approved and Edmonton will see four, with design work to be done on a fifth. Not only will these new schools help our kids get a better education but, because of our government’s reductions to a range of mandatory school fees, it will cost less for parents to send their kids to a great public school. We will also invest in new health-care facilities. When we took office, glaring infrastructure issues in health care needed fixing. There’s a bus in Lac La Biche where people have been forced for years to get their dialysis treatment. The bus doesn’t move, which is odd for a bus. The reason this dialysis bus doesn’t move – the wheels have literally come off. It just sits there, in a parking lot, up on blocks. Sometimes the power in the bus goes, because the electricity link between the bus and the hospital isn’t all that great, and when it’s really cold out, dialysis care gets cancelled altogether. Families in the area have said for years that this is no way to be treated. They shouldn’t have to trudge out in the cold, then climb up on a bus with no wheels. We agree with those families. It isn’t right. The fact it remained this way through the last oil boom is an insult to rural Albertans. That’s why we are fixing this problem, with construction work on a proper new dialysis unit beginning this month. When our loved ones are sick, they deserve to be treated as close to home as possible, and they deserve to be treated with dignity and respect. Budget 2017 moves forward on much-needed repairs, renovations and modernizations of health facilities across the province, and builds new hospitals that are long overdue. In our first budget, we ended all the dithering over the obvious need for a new cancer centre in Calgary. Families in Calgary and southern Alberta need that new facility, not a fresh round of excuses for why now is not the time. Construction continues this year on that crucial new facility. In the same way that the cancer building in Calgary can’t wait, this year we will move forward on necessary health infrastructure in Edmonton. Despite significant population growth in Alberta’s capital, a new hospital hasn’t been built in Edmonton for more than a generation. Families can’t wait any longer. The need is there and it’s growing. As a result of planning started last year, this year we are dedicating additional funds to get a new hospital built in Edmonton. $400 million will be dedicated over the next four years to help turn those plans into reality. While that new hospital is being built, we will invest in necessary upgrades and modernizations to the Misericordia Community Hospital, to make sure it is able to handle more patients and care for them properly. This year, new funding will be dedicated toward the Misericordia, including funds to build a modern new emergency department. Again, this work is long overdue and can’t wait any longer. While we tackle those urgent needs, we will continue to upgrade and increase public long-term care spaces, making further progress toward our commitment to build 2,000 long-term care beds across the province. In Calgary, we will get to work on a new and much-needed long-term care facility. This facility will have 200 beds and will be designed to make sure people with complex care needs, such as Alzheimer’s and dementia, get the safest, best care possible. At the Norwood Capital Care facility in Edmonton, work will begin on new and renovated space to accommodate 350 enhanced long-term care beds, offering patients and families a broad range of support programs and services. Necessary investments will also be made to better support child and adolescent mental health services at the Royal Alexandra Hospital and Glenrose Rehabilitation Hospital Campus. These investments will create safer and healthier environments for patients, their families and staff. And after years of on-again, off-again funding promises, followed by the wildfire, work on the Willow Square long-term care facility in Fort McMurray is back on track and will continue this year. In addition to these necessary investments in hospitals and long-term care homes, we are going to keep renovating and expanding hospitals, health centres, care homes and health infrastructure across Alberta. Just as our modern and highly industrialized province needs great schools and hospitals to help families thrive, so too does it need highways and bridges that get people and goods where they need to be, efficiently and safely. Budget 2017 will put more Albertans to work through necessary investments in our highways, bridges and public transit. Families in Fort Saskatchewan have been clear that current highways and bridges in the area don’t have enough capacity. The area has grown substantially over the last couple of decades and more needs to be done to ease traffic congestion and help get people where they need to be. For this reason, we are going to twin the Highway 15 bridge, which is the only river crossing in the area. Planning and design work will begin this year. This investment will reduce travel times in the area and improve routes between Fort Saskatchewan, Edmonton and the Industrial Heartland. As well, together with the federal government and the City of Edmonton, we have committed to a historic agreement to transform the Yellowhead Highway through Edmonton, making sure this essential route is faster, safer and able to support future growth and increased industry traffic. We are also partnering with the City of Calgary to make sure Deerfoot Trail is able to accommodate new and growing communities in the south, with a new interchange to be built in the southeast, at 212 Avenue. We will continue to work to improve public transit across the province, and also this year we look forward to working with both the Cities of Calgary and Edmonton to further develop their LRT projects. In Alberta’s north, we will continue to make sure families and industry have the infrastructure they need to get around as safely and efficiently as possible. Last year, we funded a new bridge in Peace River – an essential project to connect residents to schools and hospitals, and connects critical transportation routes for industry in the area. The tender for this new bridge work will be awarded this year. Also this year, to improve life for families, and to make sure loggers, oil sands workers and agricultural producers have safe and efficient routes, we are going to replace the Highway 813 bridge, near Athabasca. To help make life better for Indigenous communities, this year we are partnering with the federal government to make sure every household on a First Nation in Alberta has access to a clean and reliable source of drinking water. For Alberta’s part, we will invest $100 million to integrate existing drinking-water systems with federally supported water systems. By building these links between communities, we can end the longstanding and shameful number of boil-water advisories on First Nations and make important progress toward fulfilling our commitment to the United Nations Declaration on the Rights of Indigenous Peoples. In Red Deer, we will rectify the community’s longstanding concerns regarding a lack of appropriate courtroom space. Court space is so tight in Red Deer that some proceedings have been forced to take place in a local hotel. Community leaders have been clear that building a proper new courthouse is a major priority for their area. The previous government failed to act on this urgent and well-known priority. We won’t repeat that mistake. This year, we are going to get to work on building a new courthouse in Red Deer. Another long-standing issue that cannot wait any longer to be fixed is the need for a new Provincial Operations Centre, or POC. During the Wood Buffalo wildfires, flooding in southern Alberta and wildfires in Slave Lake, Albertans saw first-hand how critical the POC is – it is a 24/7 hub of life-saving emergency management and disaster response. The women and men who staff our POC have done an amazing job managing in the aging and confined space from which they currently operate, but they need a better-designed, modern new space to manage future incidents and disasters. This year, we will improve our ability to respond to major emergencies and disasters by getting to work on a new and badly needed Provincial Operations Centre. Budget 2017 also puts Albertans to work building and renovating affordable homes for seniors and families. All Albertans need this basic level of security in their lives, the security of knowing they have a roof over their heads – a warm place to sleep, study and build a better life for themselves and the people they love. While some may use economic downturns as an excuse to gut public services and turn their backs on the families who need help the most, we won’t. Budget 2017 builds badly needed affordable homes for Alberta seniors and families, and continues to make long-overdue repairs to existing housing. Historically, this is an area of the budget that has been starved for resources, which meant some units got really run down. There were units that were forced to close altogether because the foundations were so badly cracked. Others have leaky roofs, windows that won’t open, and aging and unreliable heating systems. Families deserve better. Homes should be safe and comfortable. This year, we will continue to build and modernize affordable homes and seniors lodges in cities and towns across the province, from Clairmont to Fort Macleod, from Cold Lake to Canmore. Some of these communities will see new housing facilities built to replace old units, while others will see expansions and renovations to make them better and safer for seniors and families. Work that will get the green light this year includes at least 50 units of a seniors lodge in Barrhead, 64 units of community housing in Leduc, 144 seniors lodge units in Sherwood Park, and 132 affordable housing spaces in Banff. In the Londonderry community of Edmonton, 220 affordable, mixed-income units will be built, while 24 units of supportive housing will be built in Calgary for people struggling with substance use. Affordable housing, help for Albertans who need it most, and more good jobs – another key way Budget 2017 helps make life better. The approval of the Trans Mountain Pipeline, along with the approval of Line 3, is helping to recharge investment in our oil and gas industry. The failures of previous governments to get new pipelines approved to Canada’s coast set our province back. We lost revenue, we lost jobs and we lost investment. Investors the world over were starting to think Alberta and Canada couldn’t get their act together. Mr. Speaker, working families shouldn’t have to choose between making a good living and protecting the environment for our kids and future generations. Getting a Canadian pipeline built to a Canadian coast is the best way for our world-class energy producers to sell our resources at world-class prices. That’s exactly what we want – a better deal for our industry and the stability of our economy. As was said in the Throne Speech, we won’t celebrate until the first drop of oil leaves the Canadian coast from a new pipeline. Our work is far from done. That’s why our government will continue to work respectfully and collaboratively with Indigenous communities, provinces and the federal government to do what previous federal and provincial governments couldn’t – get a new pipeline built to the coast and break the landlock that’s held Alberta back. While we diversify our energy markets, we need to do more to diversify our entire economy. Last year, we launched the Petrochemical Diversification Program, which leverages $500 million in royalty credits to support nearly $6 billion in new private investment in Alberta. We will take further steps to diversify and strengthen other parts of our economy. Business leaders and innovators have told us access to capital is key. That’s why we extended capital to Alberta companies through ATB and AIMCo. Through AIMCo, $185 million in new investments in Alberta business have been made, and ATB has provided more than $795 million in loans to nearly 3,500 small and mid-sized Alberta businesses. In addition to expanding access to capital, new tax credits are helping to drive new investments in Alberta. The Capital Investment Tax Credit and the Alberta Investor Tax Credit are in full operation and helping Alberta businesses grow and create jobs. Our government also cut taxes on small businesses by a third. We now have the second-lowest small business tax rate in Canada. This year, we will continue to identify opportunities to help drive innovation and create jobs, especially in the areas of clean technology, health innovation and value-added agriculture. The Alberta small brewery grant program is creating jobs and driving new investment. This year, we are going to build on the success of our craft brewing program and work to model a similar program for Alberta’s craft distillers. We will also make more money available through the Aboriginal Business Investment Fund to help Indigenous businesses and job creators grow and thrive. Taken together, these grants, credits and investments in Alberta businesses create good jobs, help to strengthen and diversify our economy, and set our province’s future on a stronger, more stable footing. Mr. Speaker, Budget 2017 maintains Alberta’s huge tax advantage over all Canadian provinces. We have no sales tax and no payroll tax. The previous government wanted to saddle Albertans with an expensive health-care tax – that would have meant thousands of dollars in new and unavoidable charges for families. We immediately scrapped that bad idea. Alberta has an $8.7-billion tax advantage over British Columbia, a $9-billion tax advantage over Saskatchewan, and a $13.4-billion tax advantage over Ontario. Alberta is and always will be a great place to do business and raise a family. But affordability doesn’t begin and end with taxes. We have to do more, by addressing the day-to-day costs that hit Albertans the hardest. Back home in Calgary, when I’m chatting with my neighbours and constituents, they tell me school fees are way too high. For years, families have said enough is enough. And yet, school fees continued to grow. The previous government stood by and watched as costs for parents piled up every September. Mr. Speaker, that’s just not right. By the start of next school year, school fees for families will be cut by 25 per cent. We will cover the cost of these reduced school fees entirely through efficiencies to be found from within the existing provincial budget. Starting this fall, no Alberta family will be required to pay for textbooks, workbooks, printing and paper costs incurred by their schools. We will also reduce fees charged to students who ride the bus more than 2.4 kilometres to their designated schools. We believe families will save more than $50 million. For a family in Calgary with three kids, this change could save them over a 1,000 dollars every fall. Budget 2017 makes that possible. It will also make a university and college education more affordable for Alberta students. This year’s budget increases support for scholarships, provides more grants, expands funds for apprenticeship training, and makes student loans more accessible. This year our government will help families improve the energy efficiency of their homes and save money. Earlier this month, we invited Albertans to go online and sign up to have an energy-efficiency technician come to their home and install a range of new, energy-efficient items, from smart thermostats to high-efficiency lighting. The demand surpassed everyone’s expectations. In the first 24 hours following the launch of Energy Efficiency Alberta’s website, nearly 17,000 households signed up. That has grown to almost 70,000 households. We are now expecting over 100,000 households will sign up this year. As a result, we will expand the availability of this hugely popular program to help meet this pent up demand for energy efficiency in Alberta’s households. And new programs, rebates and incentives are on their way for homeowners, renters, municipalities, businesses and non-profits. Electricity rates will be capped this year to protect Albertans from the volatile price swings they saw under the previous government. We will expand our ban of door-to-door energy sales to better protect Albertans from scams, fraud and bad deals. We are also helping families who need help the most. Every person in this House can agree that no child should go to school hungry or without the essentials, like a warm coat when it’s cold outside. The Alberta Child Benefit program is one of the most significant anti-poverty measures introduced by our government, perhaps one of the most significant in a generation. Budget 2017 continues this benefit, which provides support to Alberta’s most vulnerable families and hundreds of thousands of children. Budget 2017 also helps families by keeping our commitment to provide long-term, stable funding for health care. Our health-care system must meet the needs of our changing population. This year, new investments will be made to provide better care options in the community, improve homecare and expand mental health services. One in five Albertans is affected by mental health issues, and it is estimated that over 10 per cent of Albertans will need substance-use treatment at some point in their lives. Mental health and substance use is the first key area we are focusing on to make community-based health care better for Alberta families. This includes better coordination of services among hospitals, treatment facilities, and the community, and ensuring Albertans can get the services they need as close to home as possible. The same goes for home care. New funding this year will focus on making it safer and more sustainable for seniors to live healthy, independent lives. This will reduce pressures on our hospitals and long-term care facilities, while making sure we are doing everything we can to help seniors remain exactly where they want to be – in their homes. Just as we are providing stable funding for health care, we are doing the same for education. Education is one of the most important investments we can make in our future. In a fast-changing world, we owe it to every young Albertan to give them the tools they need to realize their dreams. We are fulfilling our commitment to fund enrolment growth, maintain a stable teacher workforce, and cut school fees to make life more affordable. Alberta’s kids deserve no less. Once they graduate from high school, we are making sure there is a place for them in Alberta’s colleges, institutes and universities. These institutions of learning provide our province with extraordinary economic advantages. They are turning research into new companies and new jobs. They are attracting some of the best talent from around the world. They contribute to our rich cultural fabric. And, most of all, they provide Albertans an opportunity to get a world-class post-secondary education here at home. Budget 2017 provides for a base operating grant increase to institutions of two per cent per year. Providing stable post-secondary funding allows us to increase student loans and freeze tuition. We said we were going to do more to help Alberta’s youngest and most vulnerable kids, and that’s exactly what Budget 2017 does. This year we will continue to address long-standing problems in the child intervention system, and we will increase support for frontline workers. This budget will also take steps to address the historical underfunding of our justice system. Albertans deserve a strong and effective justice system, one they can be confident is keeping their families and communities safe. Building on our nearly 25 per cent increase in legal-aid funding, this year we are addressing long-standing backlogs and staffing pressures by investing new money in Crown prosecution and other areas of our justice system, helping to fulfil the Supreme Court’s Jordan decision. Whether it’s protecting public services, creating and supporting good jobs, making life more affordable, or bringing down the deficit, Budget 2017 is about staying in the corner of everyday families and making sure we all emerge from this downturn stronger. The other evening, I took a walk through my neighbourhood in Calgary. Good schools. Hockey rinks lit up in the winter. Soccer fields bustling in the summer. When there’s a big snowstorm, it’s the kind of neighbourhood where you can always count on someone coming out from their warm house to help someone whose car got stuck. And in exchange for the help, the only thing anyone ever asks is for that good deed to be paid forward to someone else who needs a hand. We are all here to do good by our neighbours, our constituents and each and every one of our fellow Albertans. When someone is out of work or wants to improve their skills, we want to help them by making sure training for a new job is available and affordable. When a parent flicks that lamp on beside their child’s bed and opens up their favourite bedtime book, we want to help them by making their electricity more affordable. And when that same parent sends their kids off to school, we want to help them by reducing the hundreds and hundreds of dollars in school fees they are forced to pay. If one of our kids gets hurt on one of those hockey rinks or soccer fields, we want to make sure there’s a hospital close by that’s well staffed and gets our kids fixed up fast. If a loved one develops Alzheimer’s, we want to do everything in our power to make sure they get care that’s specialized, highly professional, and treats them each and every moment with dignity and respect. While some believe an economic downturn means government should cut and run from things like that, we don’t. An economic downturn does not mean that our aging grandparents should get second-class health care. An economic downturn does not mean that people who already make the least should make even less. An economic downturn is not a reason to cram as many kids as possible into a classroom. As our government has from the beginning, we will maintain our focus on making life better. Budget 2017 builds on that commitment – creating and supporting new jobs, making life more affordable and protecting the public services Alberta families need. In focusing on making life better for families, it secures a better future for our province. This budget helps patients get better care. This budget helps parents who want to know their kids are getting the best education possible. This budget makes sure every child, no matter the struggles they face, can have a good meal before school and a warm coat on a cold day. This budget builds hospitals, schools, affordable homes and better highways. This budget keeps taxes on families the lowest in Canada, and it makes life more affordable for families across Alberta. Budget 2017 helps people, and in doing so it makes life better for Alberta families.